This was a really interesting QB draft, as pretty much every major prospect had significant question marks, with the various draftnik experts having significantly different rankings for the QBs. It is somewhat surprising to me that, given these question marks, that four guys went in the top 12 picks. In a totally rational world, you’d expect the position group to drop a bit in the draft, as teams needing QBs traded down to get to a point where they felt the risks and rewards were at equilibrium. But no, this is the NFL, where these question marks only meant that each team (likely experiencing group cognitive dissonance) was even more sure that they wanted to get their specific guy before anyone else, the guy they were certain would be the best of the bunch. I liked FSU’s Christian Ponder a lot more than most. I’ve spent some time around Ponder and his coach, Jimbo Fisher, and I’m convinced Ponder’s going to be a reliable, excellent pro quarterback. He’s a guy who does the little things well, and he doesn’t have any major weaknesses that should keep him from being a successful player, provided he can stay healthy (the one knock on him). I became completely sold on Ponder as an NFL prospect in 2009, when I watched him in person as he torched a very good UNC defense, bringing FSU back from behind in a hostile environment with a masterful display of all the skills needed at the position in the pros. Then, when I was in New Orleans in November of 2009, I was eating in a restaurant that had mirrors along the wall when I saw Christian Ponder dropping back to make a throw in the mirror. A bit surprised to see highlights at that point (and thinking, “wait a second, FSU hasn’t played in white pants this year), I turned around to the TV, only to realize that it was an ESPN Classic replay of the 1994 NFC Championship Game between the 49ers and the Cowboys. It wasn’t Ponder dropping back to throw—it was Steve Young. After watching in the mirror for a while, I walked out of the restaurant struck by how much Christian Ponder looks like a mirror image of Steve Young. Consider me double sold. Do I expect Ponder to turn out as good as Young? Well, considering that I put Young in my top three all-time NFL QBs, no. But it says a lot about a QB’s West Coast Offense potential if he looks at all like Young. He has a high ceiling in that offense, though it’s imperative that Minnesota get a veteran to start initially so he doesn’t get thrown to the wolves right away. 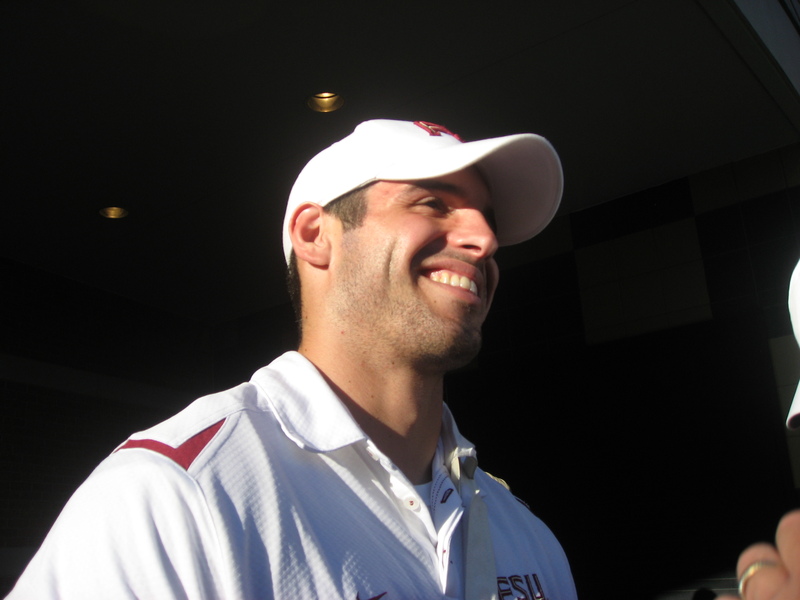 Christian Ponder (FSU): I think he’s a ten-year starter in the NFL and a fantastic West Coast Offense prospect. He’s had some injury problems, but most of them have been of the fluky variety and he’s been willing to play through pain. Good but not great size. Big hands. He has a slightly-above-average NFL arm (think Matt Hasselbeck) and can make all the throws with enough zip, though he isn’t going to knock anyone over with his velocity. Has a quick, compact, efficient release that was overhauled in his first two years under Jimbo Fisher; despite not having as strong an arm as some of the other QBs in the draft, the ball will get there more quickly because of the quickness of his release, which is more important. He has some of the best footwork in the pocket and dropback mechanics of anyone entering the draft the last few years. He does tend towards the minor mechanical flaw of opening his hips too much and transferring his weight left rather than forward, but that appears to have been corrected at this point. He displays excellent anticipation and understanding of coverages, though he can out think himself at times. He’ll be a major film junkie at the next level as he loves the game at the strategic level. His NFL coaches will have to work to make sure he doesn’t overthink on the field, encouraging him to “just play” at times. He lacks ideal touch on “bucket” throws (fly, fade, etc.) downfield, though he has the arm strength to get better there. Very accurate in the intermediate zones and will deliver the ball in stride. Good athlete, mobile, and runs to throw. Good ballhandler and will be very good in play-action situations. Needs to improve at looking off coverage downfield. Hard worker, good character off the field, good clubhouse leader. Cam Newton (Auburn): This guy could be an all-time great or Ryan Leaf/Jamarcus Russell. It would all come down to interviews for me. If I was convinced he had reliable character and is a worker, he’s without question the top pick. Elite physical prospect in every way. Freakish size/speed combo, huge hands, and may have the strongest arm other than Ryan Mallett in this draft. Has a pretty good motion at this point (unlike Tim Tebow from last year’s draft) and can tighten up his release. Seems able to respond to coaching rapidly with respect to motion, etc., though he also tends to get sloppy/lazy with his mechanics when he’s not thinking specifically about them. He’s as likely to look like Jeff George mechanics-wise in five years as John Elway. He has similar accuracy questions to what Locker does, though his mechanics have more to improve, so things may be easier to fix on that front. The amount of baggage he may bring into an NFL locker room is the question. If I had interviewed him and felt 100% confident in his non-physical components, I’d pick him at the top. The Panthers either made a huge error or got a Hall of Famer. There’s not likely to be much in-between here. Jake Locker (Washington): There’s no way I would have taken him in the top-10 given his accuracy questions. He is by no means a sure-fire guy. That said, I do like him better than the younger players below him. Athletically, he’s the next best QB in the draft after Cam Newton. Good size, plays very fast outside the pocket. Actually throws better on the run than from the pocket at this point. Like Ponder, I think a big part of his success at the NFL level will result from coaches getting him to play instinctively from the pocket instead of over-thinking everything. The game still moves quickly for him. Has a terrific arm with a quick, compact release and can really spin the ball. Has played baseball in the offseason while in college, which is another factor that suggests he has plenty of room for improvement. The real knock on Locker is accuracy from the pocket, where he is just too inconsistent. The concern is that his throwing mechanics are already pretty good, so it’s not clear whether he will ever make the leap to being an accurate passer. That said, he’s a high character player and will put in the hours. But it’s a crapshoot on whether a guy like this can ever become an accurate enough passer to start in the NFL. Blaine Gabbert (Missouri): I would have started looking at Gabbert in the 20-25 range. Big kid, strong arm (not as strong as Locker’s, however), good athlete. His release is a little long, so there’s a little time lost between the start of the delivery and the arrival of the football. The concerns here are that he has very limited tape as a one year starter and that he played in a spread scheme that typically provided bigger throwing windows than he’s going to get in the NFL. Smart kid, also works hard. Doesn’t throw on the run as well as Locker or Ponder, but it isn’t a liability. More accurate in the deep range from the pocket than either of the top two guys at this point. He’s likely to become a solid starter given the right surroundings, though I don’t see him as a Pro Bowler down the line. Ryan Mallett (Arkansas): Huge dropoff here, as I have him graded around the third round. A guy with even more character concerns than Newton, but he does have big time tools. Huge guy but also a statue. Probably has the strongest arm to enter the draft in the last five years. Above-average but not elite release quickness and good overall throwing mechanics from the waist up. Footwork is lethargic, he doesn’t get the depth on his drops you’d want (or expect from a guy his size), and he relies far too much on his arm strength. Will throw off his back foot and can be baited. Not a hard worker. Not a total project as a lot of the foundation is there, but he hasn’t been a hard worker so far, so why expect him to become one once he starts getting paid? Could be an elite starter if he straightened out, but again, not the kind of guy I’d be going into the draft to land. Could be a really good one if he lands in a good situation, his attitude straightens out, and he gets his footwork in order. Could also be a washout. Colin Kaepernick (Nevada): Tall, rangy kid with a really strong arm but an equally long release. Inconsistent with his release points, but that also means he can throw through different passing windows as need be. Very raw prospect. Could be Randall Cunningham or a two-year third quarterback. Very good athlete who can run and throw outside the pocket. Also seems to have good intangibles, though I know less about him on that front than about the others above him. I’d consider him if I had a solid QB situation for a couple years and could think about a developmental pick. Probably best suited for a Coryell type offense with more downfield stuff. Andy Dalton (TCU): I’m not as high on him as a lot of other folks. He has good size but is an average athlete, has an average to slightly-above-average arm, and played in a spread offense typically against lesser competition with huge passing lanes. I figure he ends up a career backup, but he could become a starter in the right circumstances. Ricky Stanzi (Iowa): Struggled some in the postseason examination period and needs a lot of work on his footwork. Decent athlete, good size, average arm, above-average release. Struggles with accuracy mainly because his footwork is not very good. Good deep ball when his feet are set, though. Greg McElroy (Alabama): At worst you’re getting a really smart clipboard holder. Solid release, average arm, slightly under ideal size. Very accurate in short-to-intermediate range and can manage the game. He’s not a great athlete, but has good footwork and gets the most out of himself. Good character, probably a #2 QB for a number of years in the league. Tyrod Taylor (Virginia Tech): Undersized but has a good arm and instincts. I remain curious to see what would happen if an NFL team decided to take about three guys like Taylor at QB and then line up in a spread-option type offense, aware that they may lose a QB for a few games here and there but having a replacement on the sideline. Could be a reasonable #3 QB who could also contribute at other positions. Had poor footwork until his senior year, when he showed noticeable improvement.